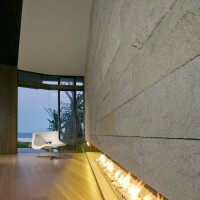 BGD Architects have designed the Albatross Residence in Mermaid Beach, Queensland, Australia. 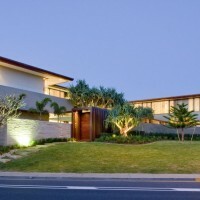 Situated on an exclusive residential street, with only one neighbouring property to the north, the site adjoins extensive park to the south and absolute beachfront to the east. The residence successfully achieves its own oasis, by capturing beachfront vista and access whilst maintaining a private yet expansive pool and entertaining core. 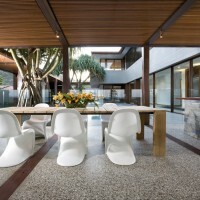 This residence is designed to accommodate a growing family, multiple guests and frequent entertaining. 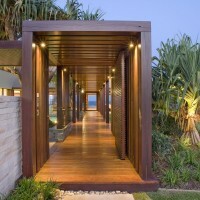 Entry to the residence is via a recycled timber colonnade and gatehouse that grants covered access to both wings of the house. The street front facing wing accommodates guests generously with their own living area, kitchen and bathroom amenities, with a secondary stair linking to the main media, bar and games room below. A wide glazed hallway wraps the central courtyard on both the ground and first floor giving scenic circulation past the main amenities whilst providing aesthetic flow, travelling the timber stair. 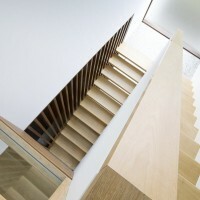 Privacy is ensured and natural light is made abundant as the open tread stair is backlight entirely by opaque glazing. The centralised amenities assist easy access and circulation to ensure a well functioning home. 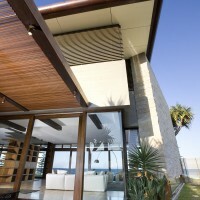 Louvred glazing has been utilised throughout the home to control ventilation by natural breezes. 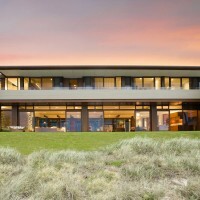 Twenty five metres of glazing capture the absolute eastern beachfront of the property. This expansive room is catered for by the marble and timber finished kitchen with chef’s scullery and abundant cold and dry storage behind. Multiple dining and living areas are defined by furniture and finishes allowing a fully transformable space if the function so requires. 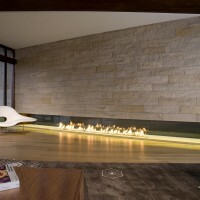 Entertaining the end of the room, a split faced sandstone wall is suspended over the flickering floor level fireplace, visually playing on weight and spatial elements. The upper level upholds all of the ground floor’s quality and design functionality and continues play with material and space. All of the bedrooms afford beachfront orientation due to the broad width of the property, each with its own ensuite and walk in robe. The private master suite boasts views both the beach and the internal courtyard, yet achieves an intimate aesthetic through finishes and textures. Warm finishes and textures flow into the ensuite as the sandstone wall rises from the floor below to the angled glass skylight beared directly above the double shower. 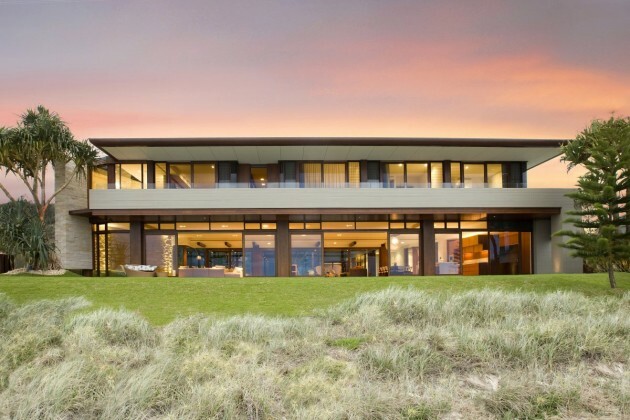 Running the length of the eastern façade, a sandstone tiled balcony allows the family to check weather conditions and enjoy the beach aspect throughout the day, consistently utilising indoor to outdoor spaces. The internal and external palette of finishes of natural timbers and stone cohesively create a tropical, modern and comfortable ambience. 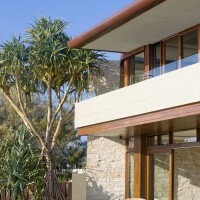 External finishes of recycled timber, natural stone, and copper allow the property to further develop character over time. 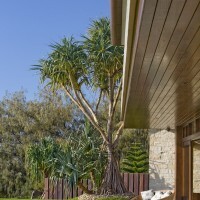 Tall mature trees matching the scale of the house are intentionally located about the property to frame the beach front, the main entrance and internal courtyard. 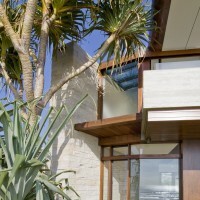 Two palms boarder the swimming pool as the wet edge between graces the length of the timber colonnade softening polished concrete and rough stone finishes. 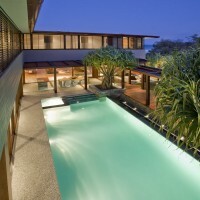 Lighting of the landscape at night creates drama within the timber battens and palm fronds, backed by the ambient aqua glow of the swimming pool.